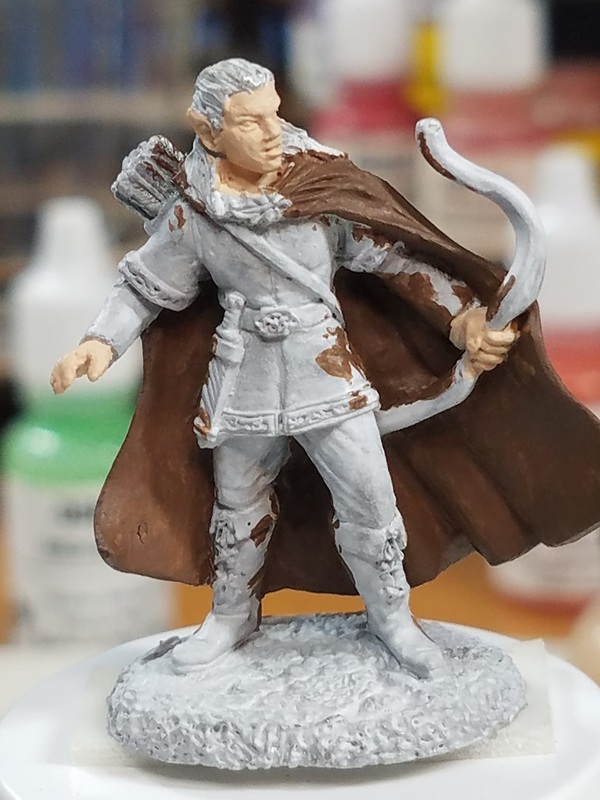 Started working on this guy today for one of my player. 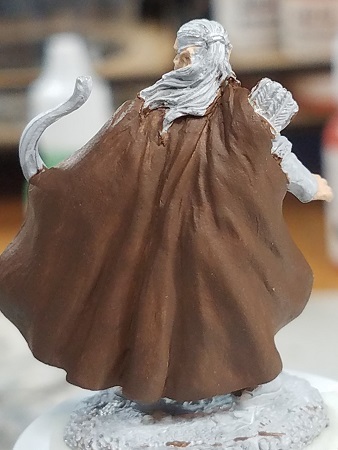 Since I'm a "newbie" and have no experience in working with skin, I was wondering if Reaper's Flesh Wash would look ok with the Elf Flesh base-coat for the skin. For the hair, the player want him to be carrot-top with a touch of grey. 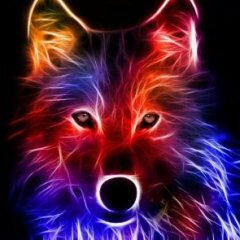 The could prove to be interesting. I'm also looking for suggestions for his clothing. almost anything is fair game, all though the campaign setting is in a desert/desolation area. I don't have any experience with the flesh wash, so I can't help you there. As far as the hair though, that's a tricky one. The thing about red hair is that it doesn't generally go gray for a very long time, it mostly just gets lighter and lighter. What I would suggest would be to go for a lighter ginger and only bring the gray into his sideburns. Maybe google pictures of Robert Redford in the last couple of decades for reference pictures. As far as clothing colour, green will look nice with red hair, but may not work with your desert theme. Maybe stick with browns, tans and cream colours and maybe a yellow-ish green as an accent colour on places like the trim of his tunic and the clasp part of his cloak. 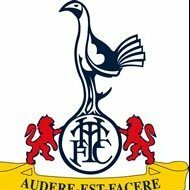 good start there, how about sandy colour with brown for boots etc? My attempt at adding some highlight & drybrushing. I think that I can consider the cloak done. Now, for the face and hair, after I view some videos. I'd like to buy a vowel. Reaper's Flesh Wash is dark. If you are going to apply it, use a control brush and aim only at shadowed areas. Hair is done (for now). And the undershirt & pants. Whoops, forgot the hair band. guess I'll to that before I work on the base & boots. After screwing up a wash on his clothes, I ended up stripping him down and putting him up in the WIP shelf. Came back to this thread in hope of finding out what colors I used originally since I lost the notes I had taken, but no such luck. (man I'm bad with documentation). Going to try to start him over to try to relax after being in classes all day. Ok, Here I go starting another WIP. I had the hankering for Frostgrave only no one around who wanted to try. So I decide to finally give the Dark Alchemy solo scenarios a try. I had skeletons, rats, and a stand-in for the alchemical monstrosity. I looked around and thought, hey those WWWOZ Tin man painted up red and gold would look cool as the FIre-Flingers for the final scenarios. I also decided I only wanted to paint them as gaming pieces. I haven't really posted anything cause my camera broke, and I really haven't wanted to pick up another. So I'm starting this WIP to practice with my phone camera, as well as post here a little more often. Unfortunately, I had a TPK in scenario 2. The scenario called for Wizard or Apprentice and 4 of soldiers for the mission. They all went down, and I rolled unbelievable less than 5 for all of them on the survival roll. I'm less than inspired to complete these guys now. but I'll carry on and hope that the apprentice can survive the final encounter with whats left of the warband when I finish. Sorry for being away from the Forum for so long. So ... how does one pronounce "peryton"? I've usually said it like "keratin" (stress on the first syllable), but I suppose it could rhyme with "enlighten" (stress on the second syllable) instead. 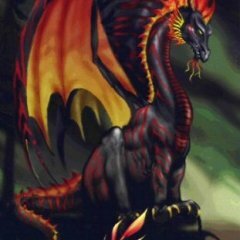 I realized only weeks ago that I had been mispronouncing "wyvern" all my life, and the first syllable is long like "five", not short like "shiv". I taught a class called "Fur, Feathers, and Scales" class at ReaperCon 2018. I used the Bones peryton as a demonstration, because of the big feathered wings. The first-edition Monster Manual gives the coloration of a peryton as blue-black head, black horns, green wings, and blue chest (male) or drab chest (female). I showed my students pictures of real hawks and falcons, most of which have dark tips on their wing feathers, and sometimes a series of dark stripes. Then I painted one of the peryton's wings to have stripes like that (black on green). 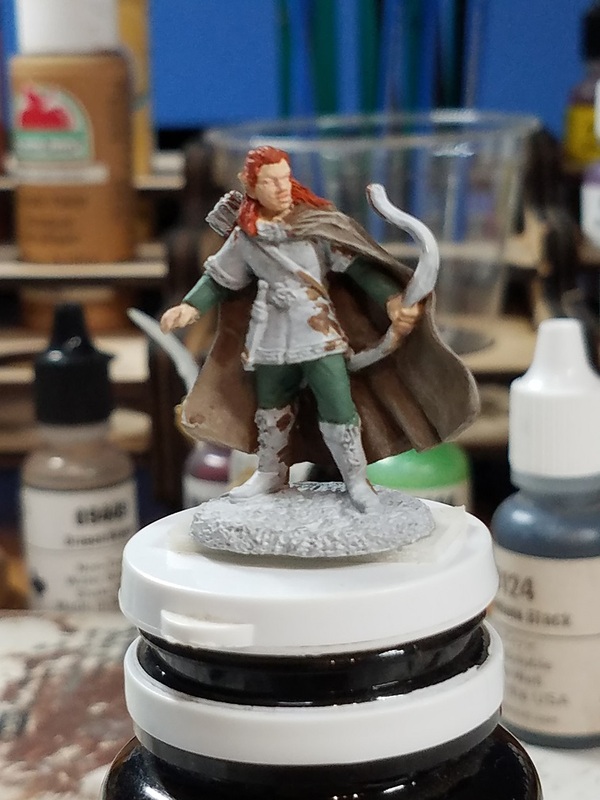 Now I've decided to paint the whole figure, to at least a good tabletop standard. 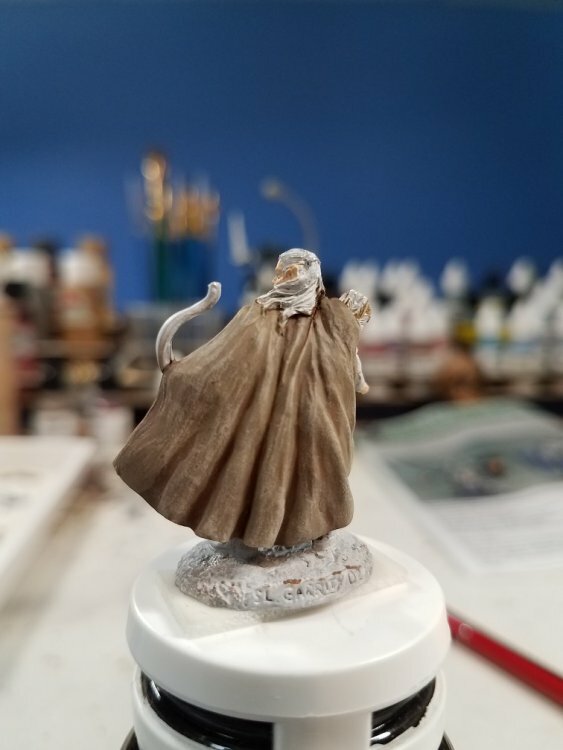 I attached it to a 50mm round base, sculpted some extra rocks, and sculpted the skeleton of a past victim (a Reaper pewter skull, plus bones made from putty). Perytons bite the hearts out of their prey, so I made the skeleton's ribcage open/broken in front. 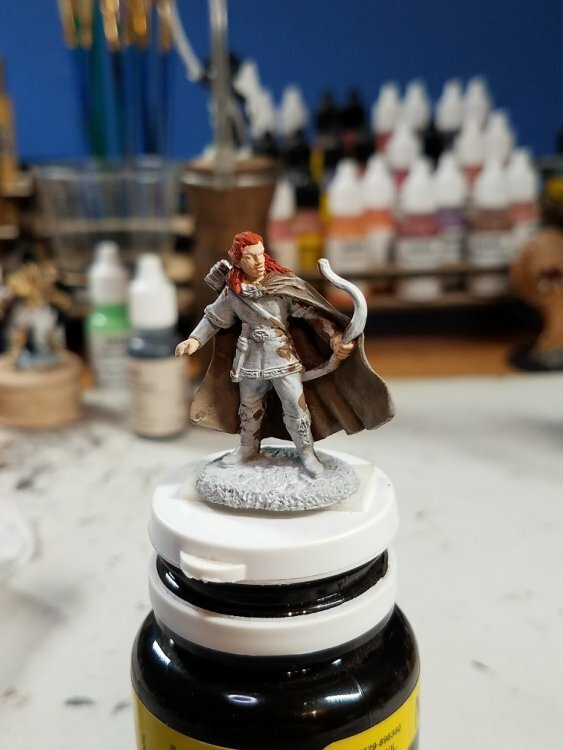 Here's how my version looked after I spent 2 hours slapping on Black Brush-on Primer and White Brush-on Primer, to establish the overall values. The primer didn't fully cover the striped green wing from my ReaperCon class. Here’s my next big project, a 1984 Ral Partha dragon. This old fellow was in pieces when I received him, and painted. I’ve cleaned him up, removed the old epoxy glue, pinned him back together, and tonight realized it looks like he’s rising out of the water. He needs a bigger base, which I have (75x46mm oval). But I have never done any basing, and I’d like to create a base that extends the appearance of water. I have no idea how to do that, so any and all suggestions and illustrations are welcome! Yet another new mini, this time it's The Visarch, a mysterious Elfin knight. It's 1:1 Scarlett Red/Black > Black Wash > 1:1 Scarlett Red/Black > 1:1 Scarlett Red/Black with a brushtipful of Ochre Yellow. Since this guy jumped the queue it could be a while before anything else happens to him. 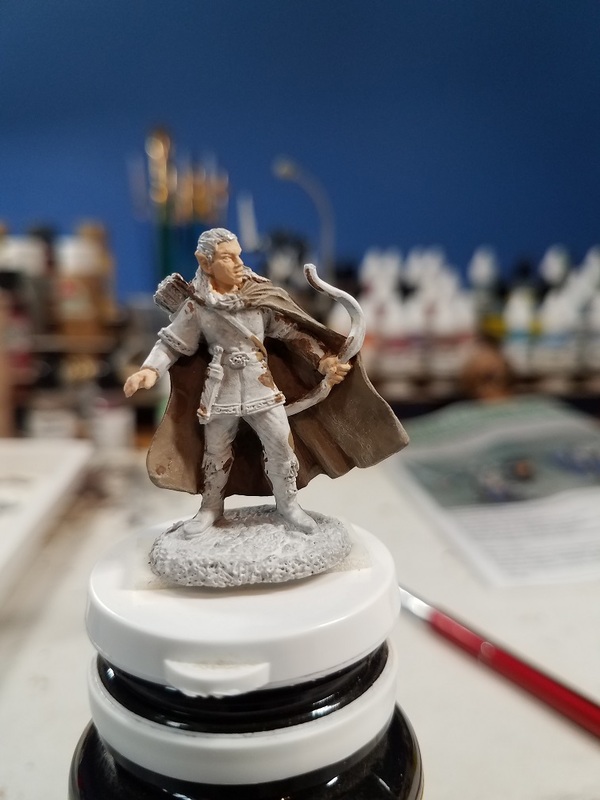 This was originally not one a mini I planned to paint. However, I got two in an auction lot and the base fits well with one of my few base stamps (in this case, the Happy Seppuku Stone Shore stamp) so... why not? I've decided her doublet, pants, boots, and gloves are leather. Her doublet and pants are stitched in the front and are worn over more normal clothes. (Both her doublet and pants have obvious stitching in the front and the alternative is undesirable in a family friendly environment.) Her shirt includes her loose poofy sleeves. (Which are probably good for a rogue since they mask the shape of her arms.) I believe the most interesting detail missing from her store page is her knife holster on her left leg. I wasn't entirely sure what to use for colors so I did a mockup using my paint program. The knife in her holster will not be visible from this side but I included them to get an idea for how they would look. 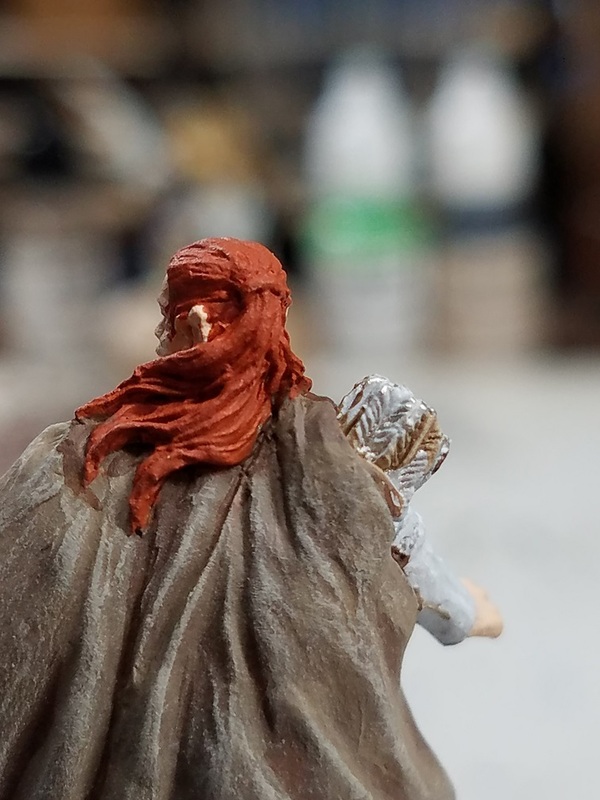 The focuses for this mini are her face, her hair, textures (leather and wood), and NMM for the metal bits. Let's see how this goes.